I've included a hyperlinked track diagram at the bottom of this page to help you understand the track layout here. Four of the six lines that originally converged at Tondu are still extant. 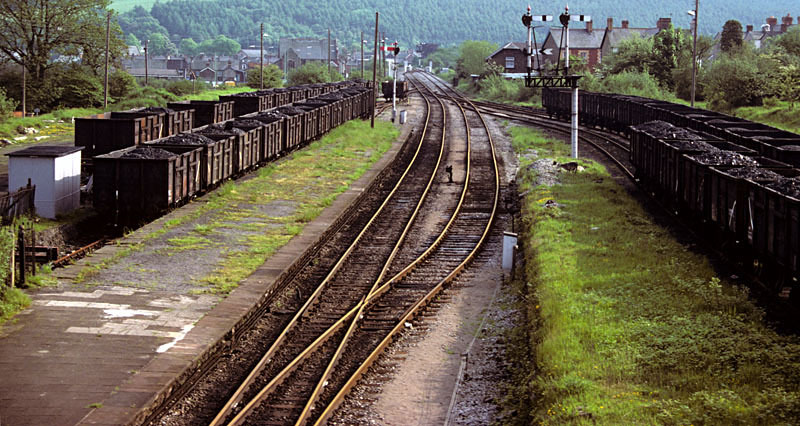 The one from Bridgend enters from the bottom right and continues towards Maesteg. 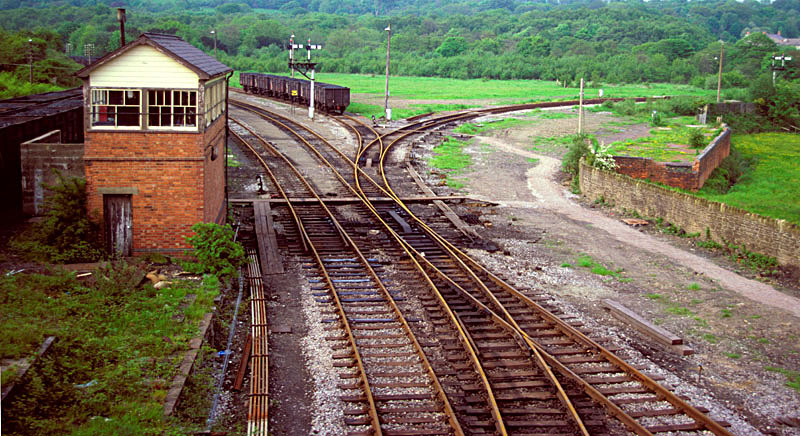 One from Margam converges from bottom left, and the disused Blaengarw branch diverge to the right. 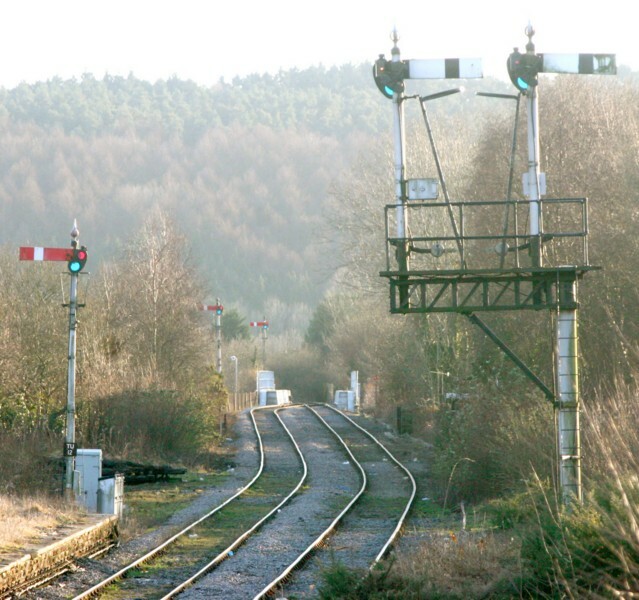 The line to Margam, now only used as a diversionary freight route, with the junction signal on the right. 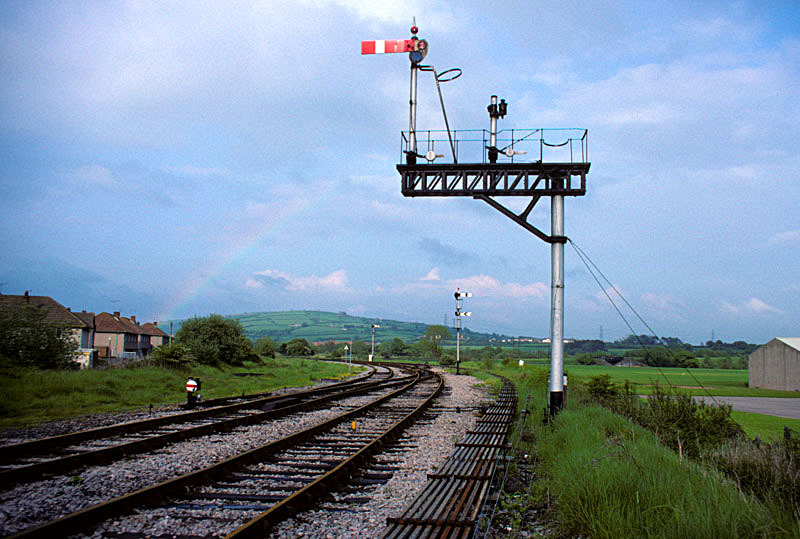 The view from the station platform, with the impressive junction signal from Bridgend (TU63). Note the route indicator under the right-hand arm. 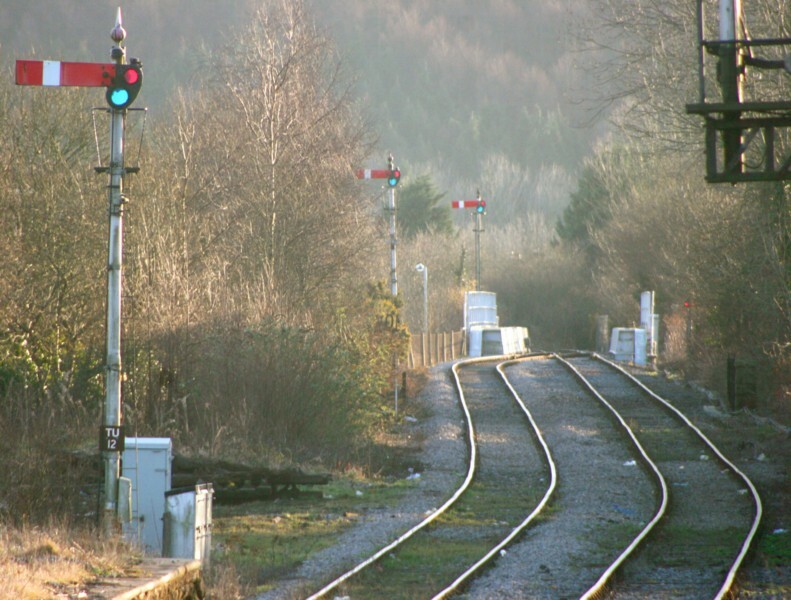 There is a loop just out of view on the Blaengarw line, and trains can be signalled into either track. The subsidiary disc reads to the goods loop on the right of the Maesteg line in the top picture. 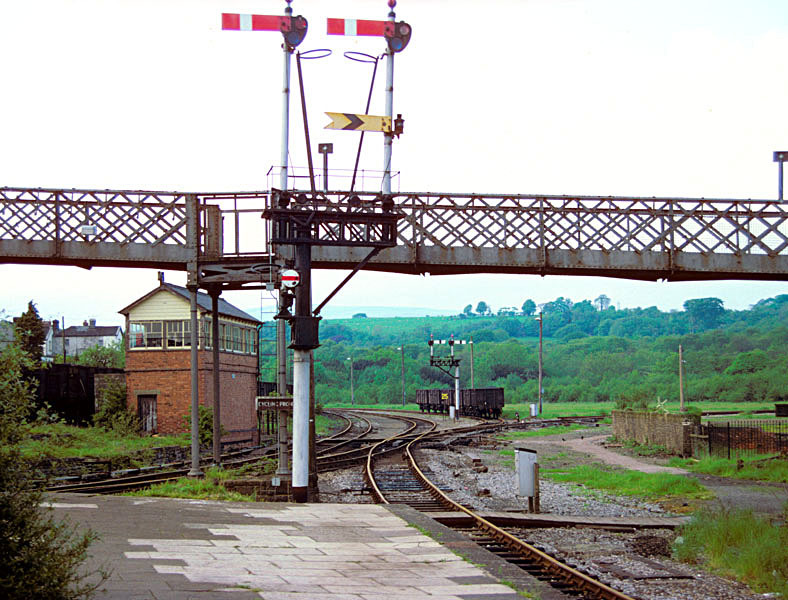 Rear view of the same signal from the footbridge, showing the station platform and the line to Bridgend. The signalman has now pulled off for the local passenger train to Maesteg. 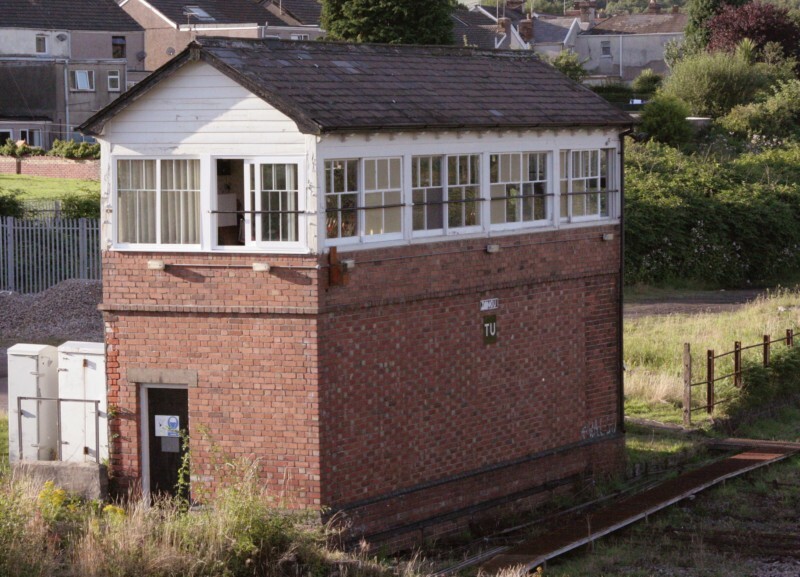 You can see that the brickwork of the signalbox has been modified at various times, including an extension at the far end. 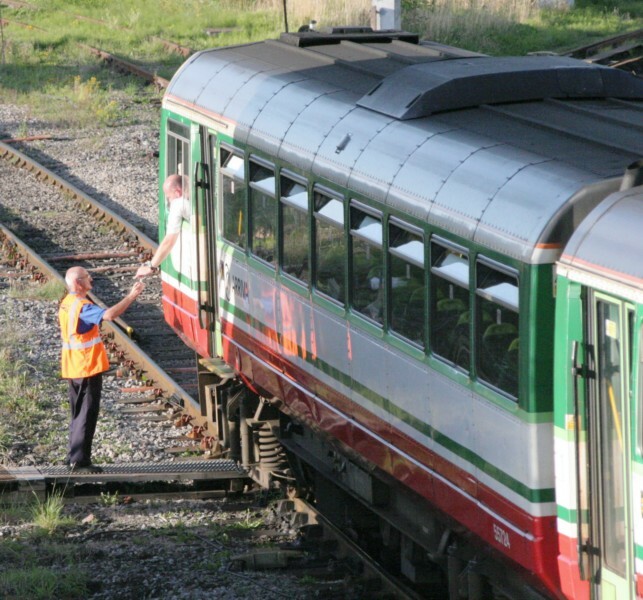 The driver of the local passenger train collects the single-line token for the section to Maesteg. This is the view from an overbridge a short way up the Maesteg line. 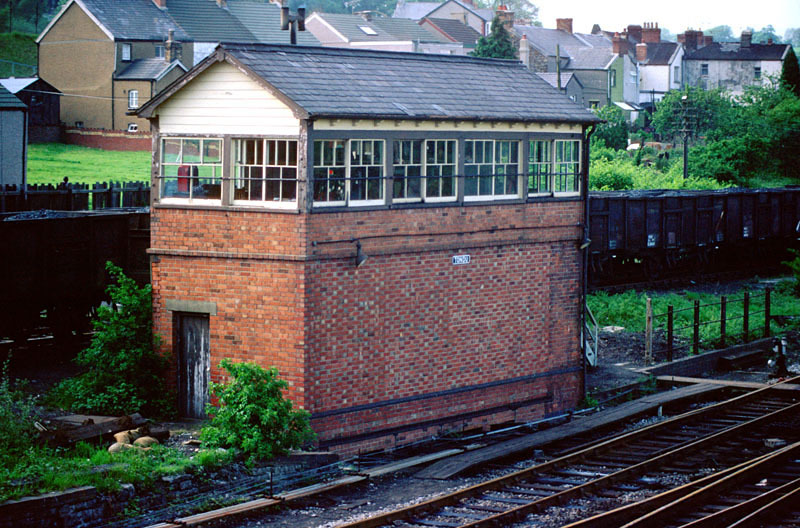 Tondu's starter is just before the bridge, and the junction signal can be seen in the background. 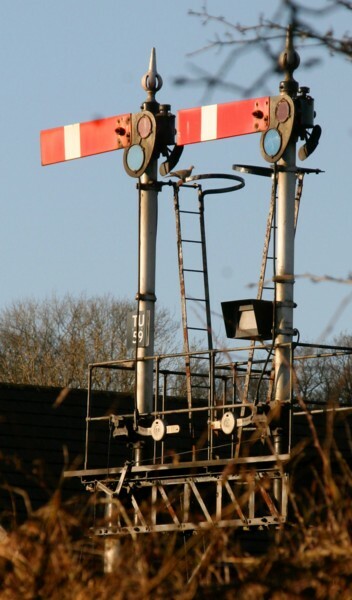 Here is a closer view of that junction signal (TU9). 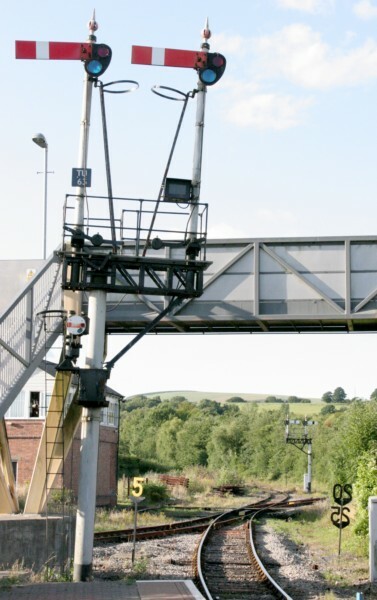 You can also see the disc that controls the exit from the disused goods loop. 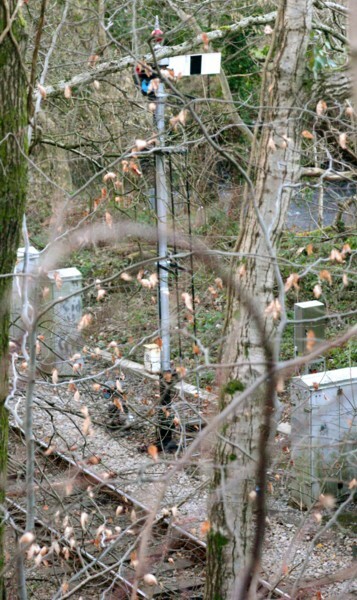 From the other side of the bridge, the line to Maesteg and the loop to up Maesteg signal (TU26). This is Tondu's down outerhome on the line from Bridgend. It is a short way in advance of the platform at Sarn. A winter view towards Margam. 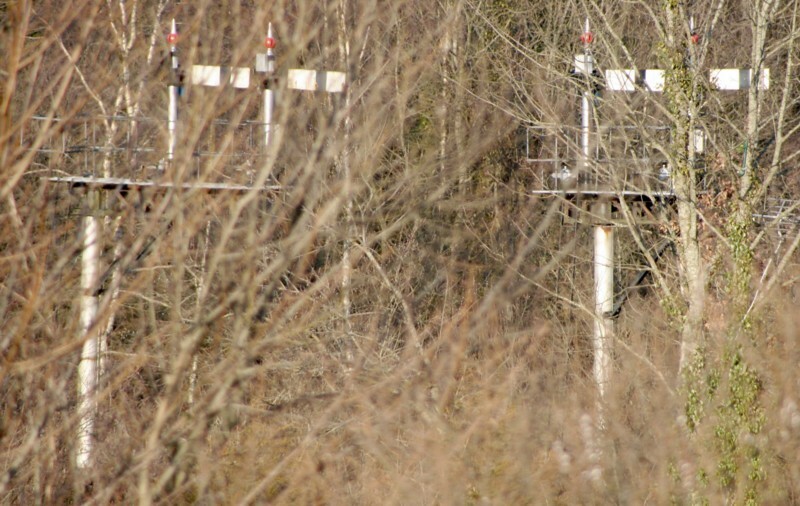 With the leaves off the trees, you can see there are in fact three signals for departing trains. A closer view of the same. 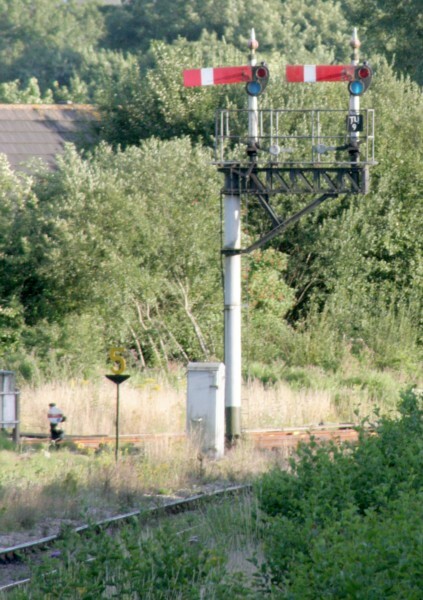 On the right, one of the lights of an elevated position-light limit-of-shunt marker can also be seen. 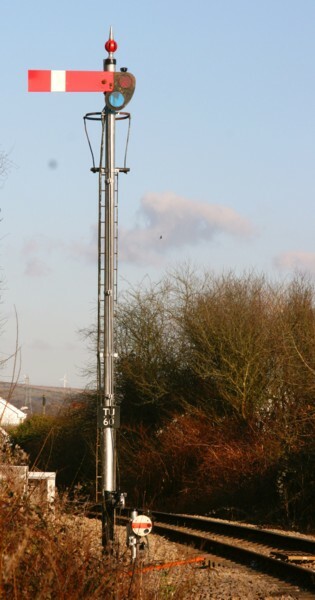 A face-on view of the junction signal from the Margam line (TU59). The up outerhome from Margam (TU60). 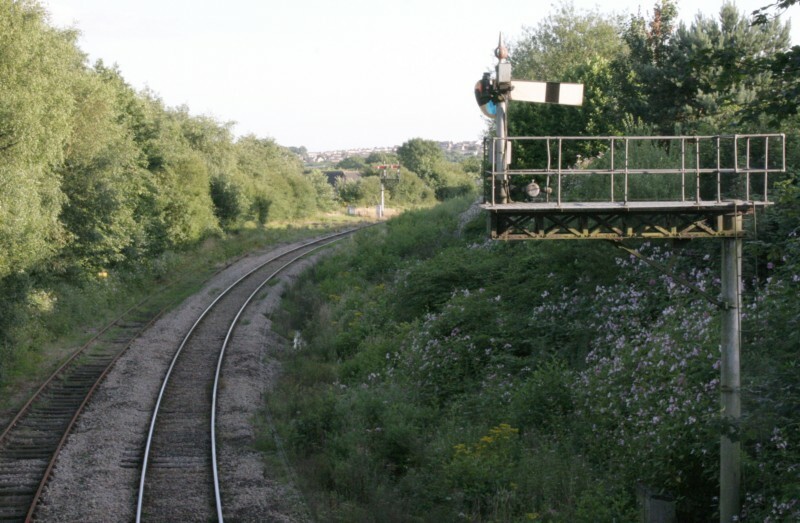 The disc controls shunting moves into the down (former platform) line. With the leaves down I also discovered there are actually two splitting signals for the Blaengarw line, one for each of the loop tracks. At this time of year I was also able to glimpse the down outerhome on the line from Maesteg. The disc at its foot controls entry to the goods loop. 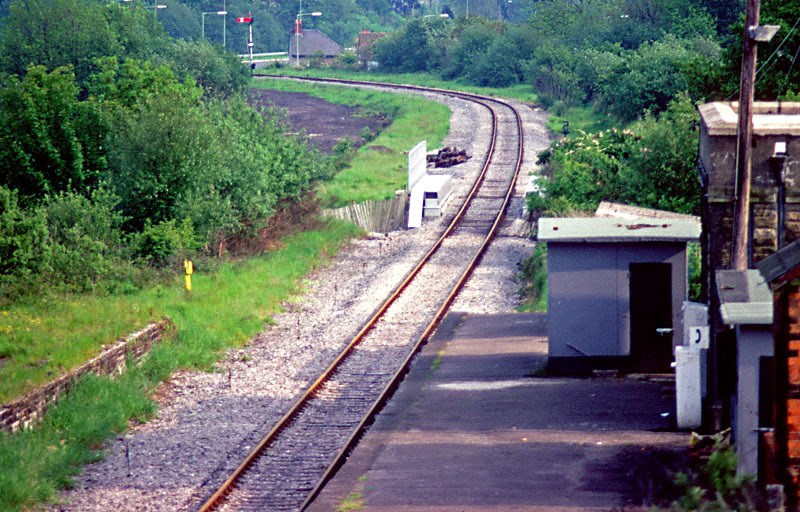 This is how the line to Margam looked in 1983. What a difference! 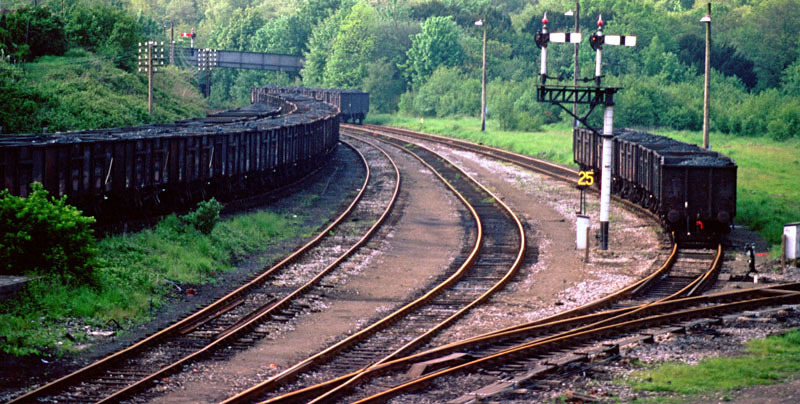 Two sidings each side of the running lines, and all full of coal trains. 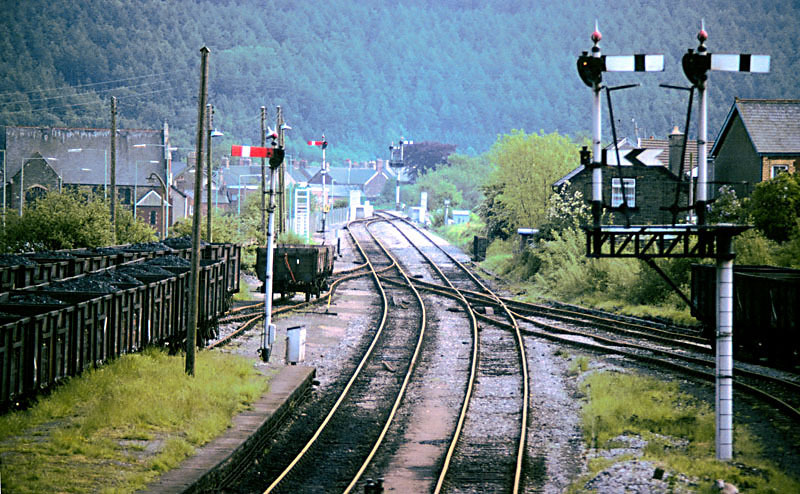 The sidings on the right in the photo above continued round the back of the signalbox, and joined back up to the Maesteg line a bit further on. The Margam line became double again before passing the box, and continued as double track up to the down Maesteg starter. 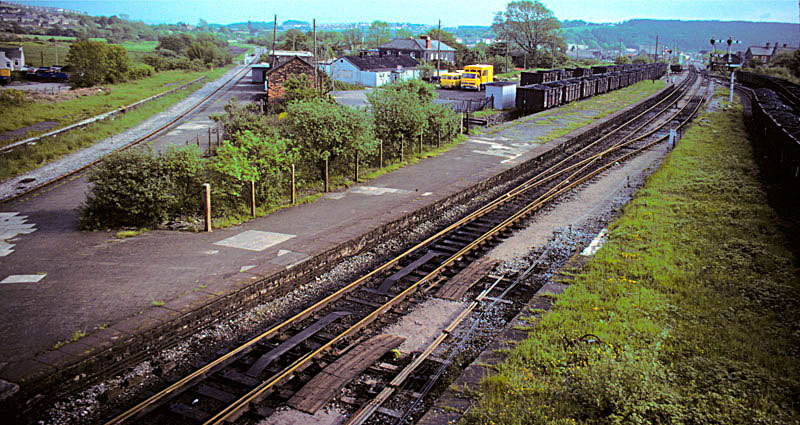 A wide-angle view of the station area with the line to Bridgend on the left. A longer-range view of the line to Margam. A splitting home can be seen immediately beyond the point where the line singles, but the advanced starter that exists today does not appear to have been in the same position then. The line to Bridgend, with the up starter visible in the distance. The down homes from the Bridgend line. 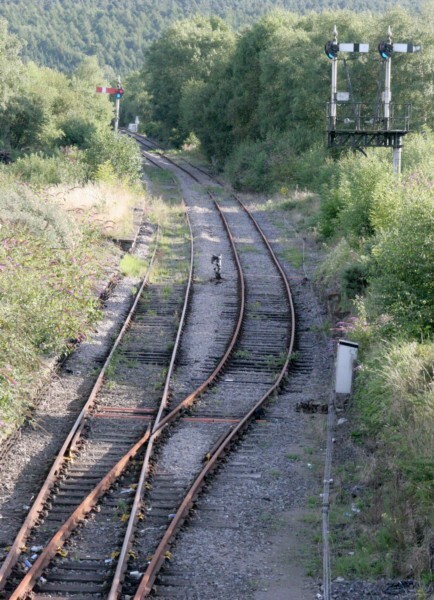 The fixed distant was for Tondu Ogmore Junction, which was still in use then. 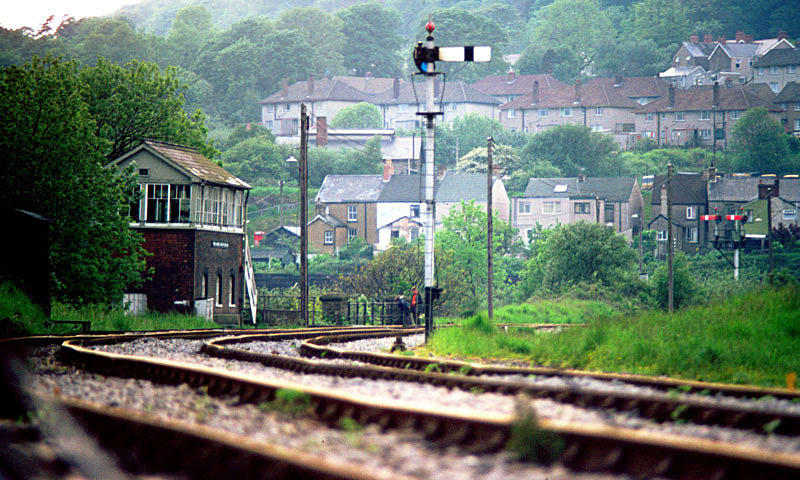 The view back towards Tondu (Middle), showing Ogmore Junction signalbox, and its home signal. 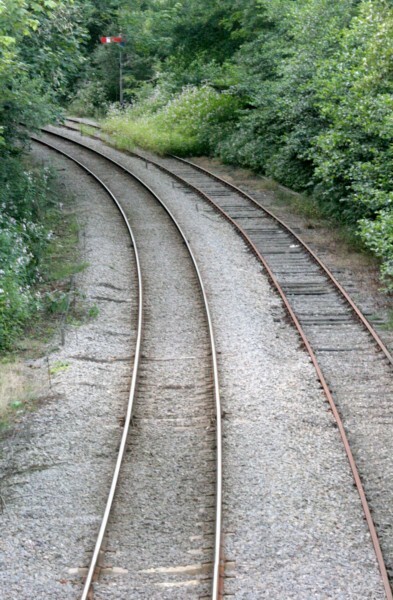 This section, which later became today's Blaengarw line loop, was a normal double-track section then. 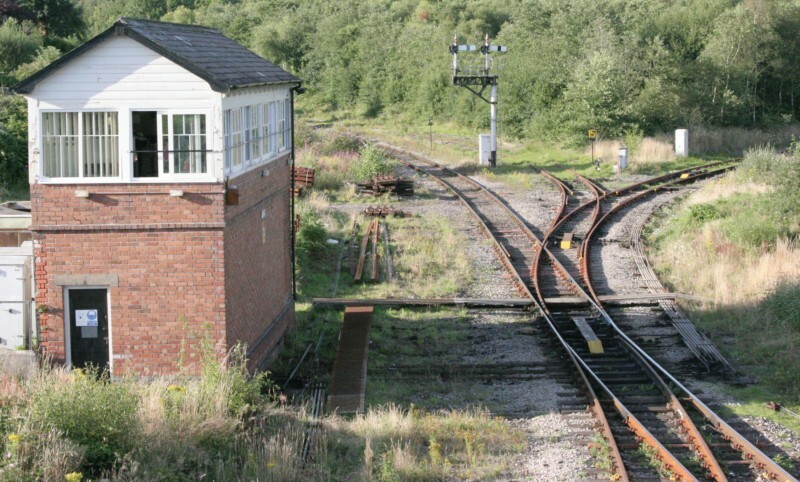 Tondu (Middle)'s splitting home can also be seen beyond that - the double-to-single junction at that end was always worked by the Middle box. I have deliberately excluded various technical details to prevent the diagram getting overcomplicated. I have, however, included signal numbers where I know them - these are the codes in white on small black plates you can see in some of the photos, and are the lever numbers in the signalbox. 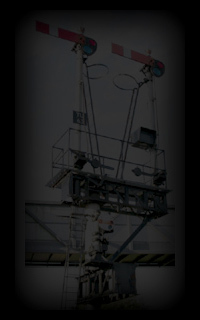 More information about Tondu signalbox can be found on the Signalling Notices and Signal Box sites. 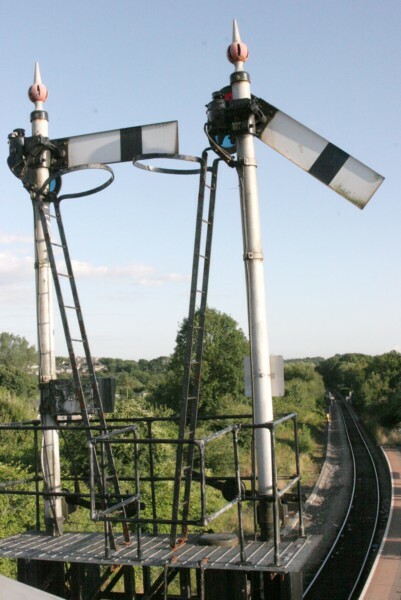 Thanks to Ian Hughes and the signalman in the 6th photo, whose son emailed me, for their input and corrections to this page.